Reminder: Bird Count/Nature Walk is Sunday! Our next nature walk is this Sunday, February 14, at 10 a.m.– the Great Backyard Bird Count/Valentine’s Day Bird Walk with the Bergen County Audubon Society. This free two-hour guided nature walk starts outside the Meadowlands Environment Center in DeKorte Park in Lyndhurst, and runs from 10 a.m.
We’ll walk in the square-mile park as time allows, looking for (and counting) wintering waterfowl, raptors and other miscellaneous birds of note. Who knows? 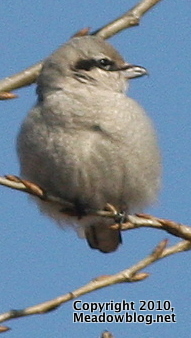 maybe even the Northern Shrike (above, left) will manage to put in a surprise appearance. The walk is run by the N.J. Meadowlands Commission and the Bergen County Audubon Society.